On any given stroll through Manchester’s bustling city centre, it takes no stretch of the imagination to conceive that Manchester has been a thriving centre of commerce for a very long time. Whilst the majority of the hundreds of retailers occupying space in the city have only been there for a couple of decades, they belong to a long tradition of buying and selling that dates back the early days of the Industrial Revolution. In a short space of time, Manchester vastly grew in size and economic output, becoming one of Britain’s most preeminent cities, a position it has held to this day. Slightly hidden away amongst the domineering structures of the Arndale Centre, The Printworks, and countless retail outlets, evidence of this heritage remains. In the Northern Quarter, on the rather uninspiringly named ‘High Street’, you will find a series of beautiful orange brick arches, the ornamentation of which draws my attention every time I walk past. Adorning each of these four arches are the words Wholesale Fish Markets, along with a unique fishing-related scene represented in miniature statue form. I’ve always found these quirky affectations extremely appealing. Today, these arches have a purely decorative function, as they now form a façade behind which is a residential area, but they continue to pay homage to the fish market that used to make up about half of Smithfield Market’s total area. It is worth noting that up until the expansion of rail networks across Britain, which allowed for the speedy transportation of goods, fish was hard to come by in Manchester, owing to the considerable distance to the coast from the city. This was undoubtedly a factor that contributed to the great popularity of the fish market, which would draw in many people for whom fish had previously been unobtainable. Other parts of Smithfield Market, which formally closed in 1972, also survive. 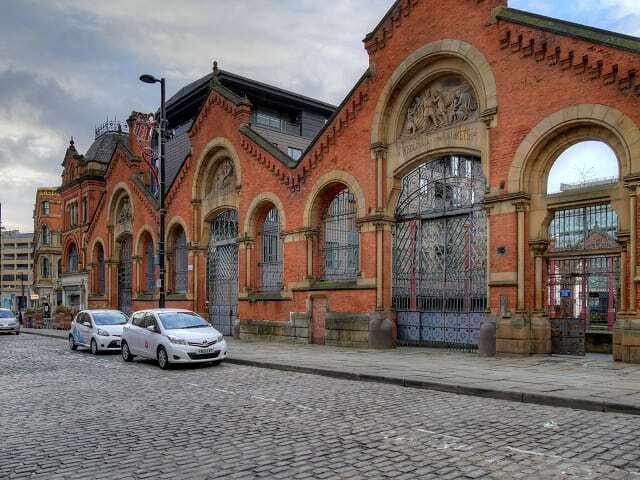 Another of the buildings that formerly made up the fish market, is now home to the ‘Manchester Craft & Design Centre’; a community-focused art hub that hosts work produced by local artists and puts on a variety of workshops. The other building that still survives is the former meat market, which lives on as a hive of high-end restaurants and bars that all share the same dining space. This conversion is in fitting with the more recent trend in Manchester of converting beautiful old buildings into expensive, trendy places to eat and drink. The remnants of Smithfield Market are another hidden reminder of Manchester’s rich, industrial past.